A small country that witnessed the rise and fall of several empires over the ages, the Kingdom of Bahrain is known for housing numerous monuments and places that date back to the Dilmunian (the kingdom’s earliest known rulers), Portuguese, Persian and Islamic empires. Such a diversified history is reflected clearly in not only the island’s monuments, but also in its architecture and culture. This brings us to Bahrain National Museum, one of the most remarkable historical attractions in the gulf’s pearl. 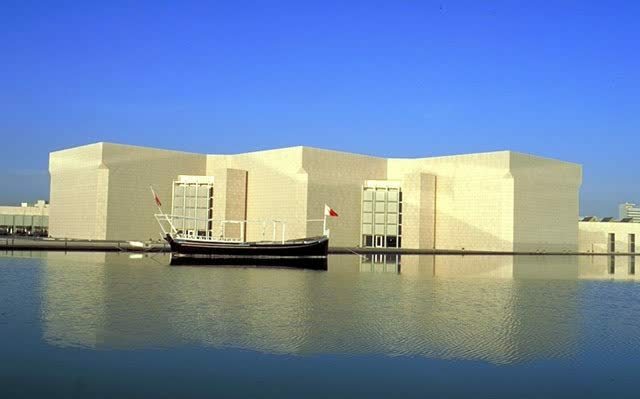 A spacious museum that is considered the largest in the Bahraini kingdom and one of its architectural wonders, the complex consists of two main buildings: the museum itself, and the National Theatre of Bahrain. If you are going in a trip to Bahrain soon, and if you have a taste for the blended magical mix of art, history and culture, then make sure you pay a visit to the place. Situated halfway between the capital Manama and Al Muharraq Islands, the museum comprises nine main halls; three of these halls are dedicated to showcasing the artifacts and monuments of the old Dilmunian ancient civilization that have survived many centuries that tell a beyond-time tale of the major force and trading center Dilmun had been once. The museum also includes two other halls devoted to demonstrating the culture and lifestyle of the island kingdom in the pre-industrial era, expressing the pivotal shifts and changes through which the Kingdom of Bahrain has been. Overall, the museum will offer you a lively view of the kingdom island’s history and culture in the old ages. If, however, you are more interested in the natural history then you need to look no further of it. The museum houses another hall that serves the purpose of showcasing the natural history of the Kingdom of Bahrain. This hall houses specimens of both plants and animals that once lived in and roamed the island. The hall’s most notable exhibitions include a real burial mound that was extracted from the desert before being transferred to the museum and then reassembled there, and a tableau that displays a scene from the famous Epic of Gilgamesh, an epic poem that is considered by many historians as the earliest known surviving work of literature. This brings us to the second part of the museum complex, and that is Bahrain National Theatre. Art and music lovers are in for a treat in this location. Ever since its opening back in 2012, the theatre hosted a number of outstanding regional and international performances and renowned artists on its stage including the famous composer Yanni, and the amazing Bolshoy and Mariinsky from Russia. In addition to this, the theatre hosts regular annual cultural events, most notable of which are Bahrain Fine Arts Festival and the Korean traditional custom fashion show. These are only two of the many, many attractions that can be found within the island kingdom that is known as “the Gulf’s Pearl.” If you are planning to spend your next vacation in Bahrain and you would like to know more about its history and culture, make sure to drop a visit to the National Museum Complex.